Veerasami (and now more of the staff) have been teasing me. They are either trying to get me to pronounce “Elam Selkuthum” (“Everything is Possible”, a favorite saying of Saint Ramalinga) properly, or are simply enjoying my awkward or perhaps impossible attempts at it. They say it, I repeat, and then they say it again, and I have not the foggiest notion as to whether I managed it correctly or not. At any rate, Krishnammal and I had a brilliant meeting with Sriram Ayer, the founder of Nalanda Way, an extraordinary young man who has agreed to put together “Friends of LAFTI – India” for us. Sriram was an IT executive, head of European operations for a large IT company. He tells the story that in 2003, already upset by the killings of Muslims in Gujarat, he was sitting in his office in Chennai one evening, when a 9- or 10-year-old incense seller came into his office. About to throw him out, Sriram learned that the boy sold incense during the evening and night so that he could go to school in the daytime. Sriram quit his job the next morning, and without any experience, founded Nalanda Way, an organization dedicated to helping marginalized, poverty-stricken, and abused children through opportunities and mentoring in the arts. (www.nalandaway.org) He is also an Ashoka Fellow, appointed for a three-year term because of his deep commitment to social entrepreneurship. Meeting him was like meeting a long-lost brother, and I am glad that we will be able to welcome him to our widening family. And the story of the boy reminds me that, even when we may not realize it, we are all lamps for each oher. Somewhere in Chennai there may be an unheraled teenage boy - homeless still perhaps, and maybe still in school or perhaps not - who is at least partially responsible for bringing joy and healing into the lives of thoussands of children in need of them. Ah, my India! It is the ground that the imaginations of the gods tread upon, their feet never touching the ground. And I have been blessed with knowing more than my share, as they are lamps to me. And that is why I'm repeatedly called upon to return. The Times of India quoted me in an article on the housing movement today. Or I should have said, ‘misquoted’ me, as much of it isn’t even close to what I told them. But the gist of the article is fine. And the reality is that, when all is said and done, we don’t know yet how many houses we will build, what the final cost will be (we are now working on free sand for the brickmaking, whether we will end up with one brickmaking machine or ten, whether the roofs will be all-tiled or just half. But this I do know: Elam Selkuthum. Krishnammal told me more stories of her growing up in Ayyankottai. She says that as late as the early 1930s, the people still had virtually everything they needed (except good houses). The Dalits (the overwhelming majority of her village) had land and cows and chickens, and always had enough to eat. Her father used to trade coffee powder and honey with the tribal people in the nearby mountain range for many varieties of fruit. She used to go to her uncle’s house with her sisters to eat wonderful kurds. Cloth was mostly supplied by the village weavers. She didn’t grow up even knowing what caste was. Yes, there were eight or nine higher caste families, but they didn’t have many children. They sat in the front of the classroom, but it really wasn’t a big deal. The schoolteacher (of higher caste) took meals in their home. It wasn’t until she came to Madurai that she really knew what caste was. What they lacked was currency. It wasn’t exactly clear to her why it was needed, but slowly but surely the men would go to the nearby town to buy luxury goods and, especially, alcohol, until by the late ‘30s, most of them had lost their land, and ended up at the bottom of the employment heap. As she remembers, no one really understood what had happened until it was too late. Her other strong memory of the period was learning to sing “God Save Our Gracious King” (George V). She hadn’t a clue who he was, and no Britishers frequented Ayyankottai. After a day of rest from my vacation, it is back to the grind. We will become Chennai commuters again. I announce to Amma that we are going to pay several unannounced visits, without appointments (since we haven’t been able to reach anyone), and we’ll see how it goes. First, there is an appointment for interview with The Times of India. Krishnammal believes they are less influential than The Hindu, but still, any press is good press (and leads to other press). We meet at Bhoomi’s apartment (which, it is now decided, will not be the LAFTI office in Chennai – instead, Krishnammal is working on moving in with the SIPA, the South Indian Producers Association, an organization of fair trade producers. She expects, probably correctly, that she will be able to make use of some of their office staff, give her the opportunity to meet more foreigners to enlist in our craziness, the people will be very friendly, and it is better located.) The interview goes fine until the interviewer asks how much a house costs. So I give them the “retail” number ($4,225), but then break it down to see how with the brickmaking and building of the beneficiaries, the contribution of the roofs, and the hoped-for portion from the government, it will come out that we have to raise about half that amount per house. And how many houses will we build? Much of that is up to you, dear friends. She chooses the number of 15,000 – she doesn’t currently have anywhere near that capacity, but if she is able to create a true social movement, who knows? It could be many more. The photographer arrives and takes a picture of this small, gray-haired old woman who runs a bit more slowly than she used to, and could easily be mistaken for a permanent resident of an Indian railway station. This is our Right Livelihood Award (“Alternative Nobel Prize” winner), who has been seen at a stop at a gas station to pick the leaves of a lonely plant standing in a far corner, and wrap them in her sari for dinner. “Lots of B-vitamins,” she says. Next, we go to see the marketing director of Marg Limited, a very large construction company with officers all over the state. Krishnammal had known him when he ran one of their offices in Thanjavur, and had promised major help (she had asked for 45,000 rupees - $1,000 – and he said it was far too little.) But he hasn’t returned her calls later, so we decide just to show up. We are admitted immediately to a rather modern office with lots of people scurrying around. Quite a contrast to the sleepy Secretariat. We are ushered into the director’s office; he is clearly in a hurry to leave, but will hear us out. He asks if we want coffee; I strategically answer, “Yes, without sugar,” in the hope that it will buy us a few additional minutes. He asks if we plan to cooperate with the government, why we don’t simply build the 10’ x 10’ house according to the government’s design. Feeling feisty, I ask him if he could live with his entire family in his office? Krishnammal follows that up with a quip that the government must think Dalit’s are particularly small, so more can be packed into a 10’ x 10’. Okay, he says, but can’t we compromise on the size? (367 square feet, plus 32 square feet for the bathroom). Amma won’t hear anything of it. I note that the government could build much bigger houses if they organized the people’s participation like we are. I see he really needs to leave, so I quickly come to the point. We need two things: a close-topped truck at our disposal to bring the fly-ash from the power station on a regular basis (Krishnammal thinks this could be as much as five times a week, though I have my doubts), and help getting cement from the cement companies at production cost, or at a wholesale. I hastily finish my coffee, get up, thank him profusely, and hustle Krishnammal out. A secretary follows us to write down what has transpired, what has been promised. This will be worth hundreds of thousands of rupees. Transporting the fly-ash alone was costing LAFTI $300 per trip. Krishnammal is in celebratory mode. The white pigeon (or, in this case, Swami David) has done the deed. “No time to stop,” I say, “No time for lunch, we’ll eat after the work is done.” I hand a couple of oranges into the backseat. Muttukumar is instructed to go to the Secretariat. We will arrive at lunch time, which is fine with me – I have a hunch. We arrive at the office of the very friendly personal aide to the soon-to-be Chief Minister (whose phone seems to have been off the hook) – he arrives at precisely the same moment we do. So this will be up to an hour of schmoozing. He will try to have us meet Stalin at 8 a.m. on Saturday (though most likely it will be Monday). We hand him our new conscious-raising flyers, relate our conversations over at Marg (he loves the remark about the small Dalits), tell him about the village drummers and the pledges coming in, and we now have him firmly in our camp (as we probably did before – we are just applying the cement over the bricks.). I know that theoretically, the government and LAFTI could find themselves in conflict (indeed, part of the plan is to shame them to spend more money on each house, or send it through LAFTI), so we are building strong allies. Another complete success: chalk up another one for the white pigeon. I spend a little time shopping (Bata sandals are terrific, and quite a bargain – mine are so old, they no longer make the same variety, and I discover I am wearing one size 9 and one 10. Shows how much attention I pay to such matters.) Ellen is now walleted and pickled. We visit a dear relative in the hospital who has just suffered a severe (and freakish) automobile crash. And then it is back to Chengelput. We receive a phone call; an Indian in Chennai wants to set up a Paypal account for us to receive contributions, and I am going to talk with him tomorrow about setting up “Friends of LAFTI – India”. The day begins with Krishnammal doing the “flag hoist” at the Republic Day celebrations in Nagapattinam. Only she didn’t, as we all arrived ten minutes late, which is par for the course. All the veterans and heroes of Tamil Nadu received shawls (more for the collection), and while Amma was receiving hers, a totally awful military band was honking away at “Roll Out the Barrel”. I’m sure they had no idea of what they were playing. We bid a tearful goodbye to LAFTI staff. Krishnammal has arranged a car from a well-wisher in Thiruvarur (she seems to have access to cars virtually everywhere) to take us on our seven-hour ride back to Chengelput. As we drove toward LAFTI, we saw another set of pilgrims, these dressed in orange and green, headed to the mountain temple of Palani to worship Lord Muruga, the Lord of Six Directions, and the god of social justice. He is always depicted as a ten or eleven-year-old boy, riding on a peacock with a spear in his hand. Muruga pilgrims tend to be a bit poorer, I think, than the Ayappa pilgrims. January 30th seems to be an auspicious day this year, something about the sun and the moon being totally opposite from each other at 6:30 A.M., and so we met with more pilgrims – these in white and yellow - on the way back to Chengelput, this one for Amma’s beloved Saint Ramalinga. He was a saint savant of the middle of the 19th Century, and in many ways seems to have been the Indian reincarnation of the 17th Century Quaker George Fox. Both celebrated the inner Light, shared by all beings; both preached that this inner Light went beyond the confines of race, religion, or national origin (and, for Ramalinga, caste as well). They also had some religious practices in common, such as meditating on a flame in front of a mirror, a practice that has since fallen away among Friends, but was apparently common at an earlier time. We first visit a rather makeshift little monastery (followers of Ramalinga, like those of Fox, are not big on ostentation.) It was founded by two people, a wife and husband team who worked with Amma in the Valivalam struggles of the 1970s, and they both remember me from 1977. They are engaged in producing herbal medicines for “women’s complaints”, and, of course, feeding anyone who manages to come by. The wife is a brilliant singer, and in the ‘70s, the pair walked from village to village singing of the Light, and calling the people to the struggle, a very brave thing to do at the time. We hear her sing a prayer to Ramalinga and her voice is thrilling. The husband swami took a vow that he would not speak in 1979, and hasn’t spoken since then. However, dressed in a tied-up white sheet, he makes himself well understood through a very dramatic sense, some meaningful grunts, and by writing on the ground or on other people’s palms (in Tamil) with his finger. We have coffee, and the swami asks for my filthy handkerchief. Although I don’t understand it the first time, it finally becomes clear to me that he is trading me a white towel for my handkerchief. Of course, I can’t turn down a towel from a swami, even if it was my last handkerchief. Krishnammal tells me that, in her experiences, the swami is a successful fortune teller. But the swami is not satisfied, and chases after the car. I can live with that, and I think a prefer ‘pigeon’ to ‘dove’; after all, I’m just a regular guy. We drive on to Vadalur, the center of Ramalinga’s revelations. Here is where he first ‘saw the Light’. Unlike George Fox, Ramalinga (although he left school at age 8), like many Tamils was a great systematizer, and wrote treatises on the nature of the Light, of reality, and of the relationship between mind and body. He built a great pink temple here, but the heart of the place is a kitchen. He came to understand that hungry people could think of little but food, and so in the 1860s, he started a communal kitchen to feed whomever came along. It is said that the same kitchen fire he started some 150 years ago is still burning. There is a large fairground surrounding the temple. Thousands of people will camp out here, awaiting the alignment of the three lights – sun, Ramalinga’s, and moon – on the 30th. Everything is being readied. Further along, we meet up with another pilgrimage. These pilgrims are all in red, 90% women, and most seem to travel by bus. They are coming to worship “Mahashakti”, the great female power of the universe. Everyone, it would seem, is on the move. So are we. We reach Sathya’s house. Bhoomi is here from Cambodia, having smuggled his ‘holy hand grenades’ – wonderful Cambodian mangoes – through customs, as these are greatly beloved by Jagannathan. Also here is a real preaching swami in orange – Swami Swatantranada (the ‘bliss of freedom’) - whom I knew as Jagdish some 32 years ago, having met him at the same international seminar where I met Krishnammal, a year before he took his sannyasin vows. This gentle soul, always late, has started two very successful ashrams, one in Rishikesh, the other in Vrindavan, the home of Krishna and the cow maidens. His ashrams are open to all, including Dalits, and he holds a celebration for the sweeper community (the lowest caste of all) once a year. Said to be a very good lecturer, Amma hopes to enlist him to build her army of compassion, appealing to the various trustees of temples, and the people themselves. He is also a protégé of Swami Ravi Shankar, author of “The Art of Living”, whose public support could make a big difference is reaching out to a larger public. Bhoomi is as handsome and terrorist-looking as ever. He seems to grow taller every time I see him (which must mean I am shrinking). He is only here for a day, as he has a conference to go to in Hyderabad, though I will see him before I leave. He is thinking of moving back to India, slowly, as he completes the training of his staff in childhood mental health back in Cambodia. He would like to establish Gandhigram as an international training and retreat center. Someone would actually have to do it. We point at each other. I’d love to be there, but my work is with Krishnammal, with no fixed abode while I am in India. As long as she is here, and she is traveling, and I am here, I carry my house around like a turtle. In our very last day at LAFTI, we had an important visitor. Not a bank president, or a cement company owner, or a politician, but a person who had paid a key role in LAFTI’s prehistory. In 1969, Chris Sadler was a member of the London Nonviolence Study Group, started by Resurgence Magazine founder Satish Kumar. Twelve members of the group went overland to India (yes, we did that in those days), to a conference celebrating the Gandhi Centenary. There were thousands of people at the conference, but somehow she found Krishnammal, and in the same way that happened to me, she was hooked. In those days after the Kilvenmani massacre, times were hard. The poor Dalits were afraid to come out of their homes, as they were threatened by both the Communists and the landlords, and their existence was meager indeed. We reminisced. I noted that in 1977 (a year after she had left), I remembered the people eating only snails and grass. Chris was in the center of many of the struggles, including being physically attacked by the hired thugs of the landlords. Now living in Scotland, her Tamil is still terrific. They all have good houses. A staff meeting is held, with approximately 40 of the 56 LAFTI staff present. I am the first order of business. I hand around a tray of dried cherries from Washington State. This has become a tradition with me, as the cherries are a reminder that there are migrant laborers living in poor conditions in the United States and elsewhere, as well as in India. I bring greetings from Friends of LAFTI and from my Quaker Meeting; I give a tee-shirt with Friends of LAFTI on it to Veerasami, and my traveling minute to Vengopu. We have a moment of silence in memory of George Willoughby, known and loved by everyone here. Then I launch into discussions of my family, the Foundation, efforts with Friendly Water for the World to launch further efforts to build biosand water filters, announcement of the first biosand water filter training to be held here in Kuthur in June and facilitated by two LAFTI staff, efforts to restore prawn farm land. I explain my “deal” with Amma, give Gandhi my computer (which I will actually have for the rest of my trip.) We joke that I am only temporarily Krishnammal’s dog but Gandhi has the post permanently, so we nickname name “Tipu (after Sathya’s dog) Gandhi”. Veerasami asks what about him? I dub him “Tambi (younger brother) Dog.” I show them my 10-year, multiple-entry visa to indicate that I plan to be back. Finally, every staff member gets a 100-rupee ($2.20) “housing movement pongal” bonus from Friends of LAFTI – each one steps forward in turn and is cheered. Now we have work to do. We are about to go on our rounds, when three people – two women and one man – arrive from a remote village. It seems that an absentee landlord has left his 70 acres of land lie fallow for the past five years, and as a result the people have no work and are hungry. (The first order of business is to feed them.) They say they are close to having to become migrant laborers, even though they have lived here for many generations. Wouldn’t it be possible for LAFTI to help them take over the land? Krishnammal deputizes a trusted worker to go there to do some fact-finding. Perhaps if we can negotiate a good price with the landlord, it can be redistributed. Then we are on our rounds. First, we go to a village where goats (and one cow) are to be distributed. I am the guest of honor (since the loan fund is set up with funds from Friend of LAFTI). I tell them that they must remember that the land they receive is not a gift; it is their right, as they and their families have worked the land for hundreds of years. But to defend this right, they must work together as a community; that is their strength. Dozens of photos are taken. Next we are off to a very remote area. LAFTI has obtained land for 650 families, and opened a new hostel (built from scratch next to a home where the landlord once lived.) There are still 200 acres which need redistribution. Krishnammal says the agreements with the landlords will be made shortly. The government was quite surprised that LAFTI chose to work in this area; after all, it is said, the area is filled with Communists. Actually, I am quite sure no government officials have visited the area; there are virtually no roads, and there is no sign that the government has ever done anything for these people. For some reason, the new hostel reminds me of pictures of the Alamo, but it is quite comfortable inside. Eighteen young women are receiving training as seamstresses on machines contributed by a donor in Chicago. Thank you! There are 30 children in the hostel; I think they range in age from five to ten. I pull out my giant sunflowers seeds – this is one of the places we are going to have a contest. Next, we visit Karunganni, the first village in the housing movement. We are very warmly welcomed, and since I have made bricks with these people, news of my presence has spread, and I am asked to hold babies. This village is entirely made up of converted Catholics (which is fine with us), but the ceremony they hold for us to inaugurate their new houses-to-be is distinctly Hindu, after the fashion of Ramalinga (the saint of light – more on him later.) 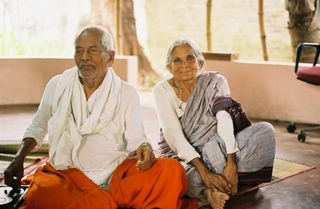 We also visit with the village priest; he says he sees Vinobaji in Amma (the highest possible compliment he can pay her – Vinoba was the walking saint, she the running saint), and will try to make an appointment with the Bishop of Thanjavur to see if they can contribute to the movement. We drive past scores of prawn farms, some abandoned, some still operating. Next stop is the home of the elderly landlord who was implicated in the 1968 killings, but has finally given up his 22 acres. I tell him what a noble thing he has done; it is clear there is now quite a lot of affection between him and his wife and Amma. Tomorrow, they will move to Chennai (their son is in Fremont, California); another part of the episode is closed. Finally, we return to headquarters in the evening. The electricity has been off for more than eight hours, and the mosquitoes are biting. So we retreat to an office doubling as Amma’s bedroom, with one candle and a mosquito coil, and many of the staff follow. Krishnammal starts to sing, and quickly Thamba arrives and starts to take down the words – she is composing on the spot (I didn’t know of this skill of hers previously), and the staff will teach the song to the village bands to promote the housing movement. Then she is inspired! She picks up a piece of PVC pipe as a cane, puts on a pair of glasses, and this old woman is transformed into…an old woman! She sings a pitiable song in Tamil about “One acre of land” – how she was a poor woman, and didn’t know that she was to pay 500% interest on a loan, how she used to work the land by day, and even by night as she was surrounded by ghosts, and now she has lost her one acre of land, and where will she go now? The end of the performance is met by dead silence from the staff. All the woman workers, and some of the men, are crying quietly. She is as well. I note that if she performs this in public settings to which she is invited, people will empty their entire wallets and purses for the housing movement. I know I would. She is emboldened by the idea; with my much appreciated imitations of coffee, tea, and tomato soup hawkers on the trains, we would make quite a team. So the terms of my trade have changed. It was originally my mosquito net, my computer, and my dark green sweater, for a green turban cloth and a brickmaker’s uniform. But it has been decided that there will be no brickmaker’s uniforms; any old lunghi (a colored dhoti stitched together at the seam) will do. “How about the computer?” she responds. She knows full well that she herself will never use the computer, but rather it will be a tool of enslavement for Gandhiji, who will be expected to make full use of its battery life to write while they travel together. But the green sweater is of immediate usefulness. “Done,” she says, and immediately calls for Bardi, who, while also the head of one of the boys’ hostels, when Amma is around seems to be some kind of cross between a personal valet, running waiter, and keeper of the phone and messages.. She says he is supposed to get my manure tomorrow. Shortly thereafter, the bank manager of the Punjab National Bank in Thiruvarar came for a visit, bringing – oh, this is better! – an ugly gray sweater for Krishnammal, but at least something she will actually use. He has come to promote a program he is doing on organic agriculture (for which his bank will provide loans, etc.) He wants Amma to come inaugurate the program. Fine, she says, now I need money for cement. She notes that the land for the Kuthur headquarters was donated from a reserve fund of Canara Bank, and she wants funds from the Punjab National Bank for housebuilding. We also want to set up donations boxes in the bank branches. That portion of begging concluded (I don’t know whether successfully), I ostentatiously refuse to take a cup of coffee, and instead take a drink of water from the biosand water filter, and use the opportunity to explain how it works to him. And then I tell him that I share his interest in organic agriculture, and would he please donate a truckload of manure for my gardens? A day goes by, into the next evening. We go to meet a family of a member of the legislative assembly (a well-respected leader of the Communist Party) to apologize that Krishnammal cannot attend the son’s wedding the next day. She is wearing the very sari that was given to her invitation. They are especially upset as the evening of the wedding, they were going to have a seminar on social problems, with many leading figures, with Krishnammal heading the bill, and the advertisements have all been printed. She manages to beg off, and will do a seminar with them the first week of February, and she will invite the luminaries herself. On the jeep ride back, I chide Krishnammal that I haven’t received my manure yet. She is about to call Bardi to demand the delivery, when a call comes in for me. It is the bank manager! One truckload of organic manure is to arrive at LAFTI tomorrow. My begging has been a success. Now I have to renegotiate my deal with Amma. We arrive at Kuthur, the headquarters of LAFTI, around 11:00. It looks the same – the same pink Kremlin of a building that serves as secretariat, sleeping rooms, dining room when needed, public meeting space, and lounge all interchangeable and some simultaneously. But wait! Right out in front of the building is an open-sided shed, perhaps 70’ x 35’. This is where the first brickmaking machine is established, inset into the ground, as well as 11 or 12 completed biosand water filters, ready for use. I see a large group of workers there, with green cloths tied into turbans, and the sounds of industry. I get out of the car, and we are met by all my old friends – Veerasami, Vengopu, Muniyan the accountant, Thamba the publicist, there are so many others. After a round of hugs, Veerasami puts a green cloth around my shoulders. I ask him to tie it into a headcloth for me, and I run to brickmaking machine. This apparently is the first hour that the bricks are being made. The men of village of Karunganni (don’t ask me to pronounce it – it is a lot more complex than in looks here), having leveled their own homes, have come to make bricks – several days early. So the machine is oiled up, everything works properly, the big drum mixes fly-ash, sand, cement, and gypsum, the mixture comes up the conveyor belt, and is pressed into bricks, two at a time. It took less than half an hour for the villagers to get the hang of it, and they are proud to be making their own homes, from the foundations and bricks on up! I make a few myself, push some loads of fly-ash, then run into the headquarters, change into a pair of shorts and tee-shirt and, still with my headcloth on, return to the brickmaking for little bit. This is, after all, a cameo appearance; the machine has been called “David’s machine” (even though ultimately I did not raise the funds for it, which were contributed by the Oil and Natural Gas Corporation), and so I have to get my picture taken numerous times. “Oh, yes,” they reply, and it is likely that lunch provided by LAFTI is better than these poor men would have had at home. They are very pleased; these are people of the land, and this is something they understand quite well. So the rest of my smuggled vegetable seeds will be used here. By the next afternoon, the first garden is entirely dug up. “This soil is not good for vegetables, only for rice” says Arul, newly deputed from Rajagopal’s staff to work for LAFTI, and who has three years of training in organic agriculture. “Oh yes it is,” says Swami David from New York City, who is known to have a white thumb – everything he plants turns to ash. I have two secrets. First, I happen to know that this particular piece of ground once had a wonderful garden of Italian vegetables, planted with seeds that Krishnammal had smuggled back from Italy. But there is a second, more important secret that will be revealed in a future installment. I immediately take a great liking to Arul. He will be a terrific asset to LAFTI if given the opportunity. An expert in organic agriculture will serve LAFTI beneficiaries well, and he also seems to have good computer skills. Most importantly, he seems ready to jump at every opportunity. I ask Krishnammal whether we can take him along on our various jaunts, to give him a greater sense of what this is all about. I know, however, that he probably understands much already, as he grew up in a major prawn farm area 40 kilometers to the south, scene of one of LAFTI’s great struggles. Later, I sit down for lunch with Veerasami, Krishnammal, and Arul. Arul is quite taken aback – it is not common for a new worker to be invited to lunch with the highest echelon of the staff on the first day. But I do finally convince him to sit down, though he will only do so on the ground, next to Veerasami. This is a constant struggle for me, as I seem to have too much status to get some of the workers to sit in a chair next to me for fruitful conversations, so I usually end sitting on the ground with them, so they can’t escape. They all nod; I hope I haven’t embarrassed Arul. It is agreed. Later, Arul tells me he has a friend who works at the Foundation’s research office in Pompuhar, so he can probably get help in researching what needs to be done. I commend his audaciousness, give him my Friends of LAFTI card, and tell him I will be checking in. We’ll see. Everything is possible. I wake up the next morning at 6:00 A.M. and come outside to greet the dawn. Not 35 feet away from me, on the pile of fly-ash, an Indian eagle has landed. Or to be specific, a Brahmany Kite, a magnificent bird with reddish brown and golden wings and white breast and head. Another three hours in the car, and we arrive at the ashram of P.V. Rajagopal, to the south and east of Madurai. It is a beautiful and well-kept ashram, donated by a European well-wisher, with many guest rooms, a bright and open kitchen, and many tables set up for discussions, with Europeans and Indians engaged eagerly together in conversation. The ashram itself is designed to promote multicultural dialogue. He is also the editor of the very fine journal Ahimsa Intenational and asks me to contribute articles to it. I have one on “Education as Displacement” (more on that in a future blog, if I ever get there!) which would fit the bill. Our discussions go well, and Raji agrees to send one of his own workers to join us at Kuthur, and to solicit support and contributions toward the housing movement on a national basis from Gandhian organizations. We sleep well, and wake the driver, and are off at 6:00 A.M. Krishnammal is in fine fettle this morning, and her head is spinning with ideas. She is going to contact cinema stars, and every member of Parliament (she knows lots of them). Also the spiritual personages (or as I call them, those with Holy Feet; I minorly sprained one of mine two nights ago and, it being black-and-blue, does not qualify.) We are going to appeal to communities that each member contribute one bag of cement. There will be folk musicians walking from village to village, beating on drums, awakening the people to the right of decent housing. International organizations will join in. And so on and so forth. She really doesn’t have the staff or resources to carry out even one-twentieth of her spinnings, but, as she insists, quoting her Saint Ramalinga, “Everything is Possible.” She notes that when she started her movement for land reform, it was only herself, in an area where she knew almost no one, and it took several years for the local inhabitants to feel free even to talk with her. Now the landlords are almost gone, just nine more in the area of the 1968 killings, and she says she will have the last remaining portions of their land within ten days, and she can wish them fond goodbyes. She has supreme confidence that this is all going to happen, and a little faith goes a long way. Pinch me, I’m home!!! After three years, my wife’s serious illness, my heart attack, death, and subsequent resurrection, I’m home! Not Olympia, Washington, but the Gandhigram Workers Home, for me the most beautiful place of lived-in real estate on the planet. Here are the magnificent Sirumalai mountains in the background to the south, where Hanuman dropped a piece of Mount Meru containing rare medicinal plants that he was bringing to Rama on Lanka. Here are the 300-400 fruit and other useful trees, collected from many parts of the world by Bhoomikumar. Here is the building itself, built with stones hewn from the mountain by Jagannathan’s and Rev. Keithanji’s own hands. The building is still a pale yellow on the outside, accented with red and orange bourgainvilla weaving themselves on the large trellis by the entrance. I have worked for more than 30 years at it, and I can say with reasonable certainty that it is impossible to get a photograph that does it justice. The walls on the inside, both of the pandal open to the outside and of the interior rooms, are still robin’s egg blue. The broad posts holding up the crossbeams are now decorated with large, framed posters of Gandhi, Vinoba, and Jagannathan, which Krishnammal and I both think is somewhat of an excess, but the workers insist. There is a small table with a picture of Ramalinga on it, and a small lit oil lamp in front. This is the pandal where Martin Luther and Coretta Scott King once sat, eating dosas made by Krishnammal herself, before taking Martin on his one and only tour of abject Indian villages. The holes in the post that once held the swing on which Jawarhalal Nehru sat are still visible. Others, too numerous to mention, have come and gone. And, of course, this is where the Friends of LAFTI Foundation was founded. And here is my room! On the right side as one enters the pandal; my bed is still exactly there where I left it three-and-a-half years ago. The new roof of magnificent red clay tiles that we put up about five years ago is holding up well. No one asks me whether I have eaten; instead there is the magnificent feast prepared by Papa (“Baby”) the cook set out for us. She remembers that I take my rasam in a cup, rather than as a rice course itself. The furniture is a little rickety, as the good stuff (as I had previously made a mental note) is now at Sathya’s house in Chengelput. Mukumal (translated as best I can as “Mother of the Nose”) asks me if I have any laundry that needs cleaning. And here is my 30-year friend Worker’s Home Natarajan (we know so many Natarajans that such a title as this is a way to indicate which one we are referring to) is still here, still looking anciently wise and distinguished, and still caring for the 30 hostel children who live in the side buildings. They won’t be home from school until 4:00 or so. I grab a quick, sweet nap on my bed (oh, it should have been longer! ), and then explain my sunflower growing contest idea to Natarajan, which delights him greatly, and give him the seeds for the giant sunflowers (including some to plant around the large rock dedicated to Keithan’s memory), as well as a little under half of my smuggled vegetable seeds. The soil is so fertile here, and enriched by the manure from the Holstein cows (hope they don’t eat the sunflower plants), that I am sure they will have a good harvest. (The land around Kuthur is a little more challenging, and mostly suitable only for growing rice.) And then I go to the little khadi store and buy four jars of Gandhigram pickles – lime, lemon, ginger, and garlic (they are out of mango), which I will bring home and treasure – they cannot be obtained anywhere else in the world. There are a few changes. Tipu the dog has a daughter here who looks just like her father. And there is a biosand water filter in the pandal. This is actually the first time I have tasted the water from one – cool and delicious. Someone here has called it “mineral water for the poor”. I get a picture of my drinking it with Natarajan; later, I will get some with the hostel children. Natarajan says the filter has been a complete success, and is especially appreciated in the hot season, when the water comes out cold. We are on the edge of the Gandhigram Rural University (and they have been eyeing this parcel of land for a long time, but we are determined they won’t get it). To build the new highway, the highway department had to take out the little stores on one side; on the other, the road literally cut through half the store buildings, leaving them half-standing, and still operating. And the bicycle tree – so named because tires and inner tubes hung from its branches, advertising the services of the bicycle repairman and the availability of bikes for rent – is gone. I wonder where he moved after more than 30 years (and maybe many more) at the same spot. Ironicallly, the Internet Café that used to stand directly behind the tree, is gone as well. The campus hasn’t changed much. We meet with a professor of Gandhian studies and a member of the Gandhigram Trust. The Vice Chancellor has already promised 5,000 bags of cement; we want 5,000 more to come from the community. The professor wants to spread the biosand water filters; I agree, but I want to train people from this community to build them themselves, as half the idea is that they should become self-sufficient. (The University is supposed to be a Gandhian institution, but you’d have to try hard to notice.) I will be meeting with our new expert Marimuthu to see if we can set up a training program. Meanwhile, I ask if the professor can bring other professors and have them make bricks with me in Kuthur? He is taken aback, and I believe he thinks I can’t be serious. I am. OOOHHH! That smarts! I had a nice evening planned, an interview about George Willoughby (the professor thought I was George Willoughby, who he knew 25 years ago! – I take that as a compliment), and a discussion with an interesting young man from Bologna who I hope to entice to become Krishnammal’s traveling companion for awhile (he is interested). I was going to watch a magnificent sunset, watch the blue parrots and the kingfishers find their night resting places, eat a good meal, and sleep the sleep of an untroubled king. But NO, plans are changed: we are being called away to our next appointment, and are unable to return. Goodbye, for now, oh, sweet home, and thank you for a precious three hours. I have gone through all of this, and I will return. Coming Attraction: My trade has now been updated to a computer, mosquito net, and green sweater in exchange for a green turban cloth and a load of manure. You’ll have to come back in future days to see what that is all about. But the reality is the expression “Have you eaten?” seems to have become an ingrained feature of Tamil conversation, or simply acknowledging another person’s basic needs. I have almost never heard anyone say no even if it were true. It is politeness ritual which has maintained its power, perhaps reflecting a culture where food has been, and in many cases is, somewhat scarce. Gandhi has explained to me that there are in fact two expressions (with my less-than-basic Tamil, I have been unable to pick up the difference. “Have you eaten?” is the politeness expression, whereas “Do you want something to eat?” can be construed as an offer (though not necessarily one you are supposed to respond to positively. We head into Dindigul. I am going to visit my veena teacher! This is easier said than done. Dindigul has grown by a factor of five since I traveled to my veena classes daily in the 1981-1982, and she lives on a one-block, dead-end street. She has no phone number, and certainly no Internet connection (though she has in fact used those of the cardiologist next door, who provides her with meals as well. But, in what could be considered a miracle, we find it! Mommy is now 86 years old, and, she says, surprisingly healthy. She of course asks us all, “Have you eaten?” but she really means it, and is desperate to serve us something. This could be quite a production for her as everything has to come from the outside, and we do our very to fend off her urgent pleadings. She is well (though she had a stroke about eight years ago can no longer play the veena), but cold and lonely. The new clinic next door has walled her tiny little house off from the sun, and she is in a warm sweater and socks (it must be 80 degrees outside). I show her pictures of my kids (she asks after Aliyah repeatedly), and I ask her a music theory question Aliyah had sent me. Her five unmarriageable nieces (coming from a high Telegu brahmin family, but her father – a Communist Party activist – died very young and there was no money for the expected extravagant dowries) are now all married (said to be by my blessings, though I think I’ve only met two of them), and four are settled in the U.S. and Canada. I give her my new business card, and we take pictures, all of them horrible, for as in old Tamil fashion, she doesn’t allow herself even the hint of a small. Sigh. She has been caught in the breakup of the old Indian family system; I am the only ‘son’ she has known, and I can’t bring her back with me to America. I woke this morning in this magnificent ashram near the banks of the Cauvery River. This ashram was founded by Jagannathanji’s brother, a former revenue officer, who 25 years ago, renounced the world, became a sannyasi (an ascetic). Funds apparently poured in, and there are many beautiful buildings, gardens tended by male sanyasis, and a school which has had as many as 800 children, I’m told. The ashram is dedicated to Sri Lalitha, a female incarnation of Shiva, representing women’s shakti - power. And since the death of the founder, the running of the ashram has passed into the hands of female sannyasis, first through Jagannathan’s two sisters, and then later to others. In fact, this will be a wedding like no other I have ever seen, for it will all be presided over by women, and (as far as I am aware) none of them brahmins. The Jagannathan family tree, somewhat like Krishnammal’s only more so, is virtually impossible for outside westerners to comprehend, with cousins marrying cousins, uncles nieces, in all various combinations. This particular marriage is one of the most traditional varieties – mother’s brother’s son marrying sister’s daughter. It is likely not quite a fully arranged nor entirely a love match. Either the bride or groom could refuse, but it is always thought best to keep wealth within the family, and so this kind of match is strongly encouraged. The wedding starts with a procession of musicians – two nadaswarams and a large folk drum beaten with sticks, followed by the bride and groom in traditional garb. The music will remain very loud during the entire ceremony, and I seem to know much of it from my veena-playing days. Much of the wedding, though in traditional form (abbreviated) seems to be run by the two video photographers hired for the job. First the groom comes, and, with the bride, washes the father and mother of the bride’s feet with milk, followed by decorating them with a red powder. Then the process is reversed and the groom’s parents’ feet are done in similar fashion. Then the bride and groom are seated, and gifts are given by the bride’s parents to the groom. A ritual fire is lit by one of the bright orange-garbed sannyasis. The groom puts his arm around the bride’s head, and places a dot of red powder on her forehead, between her eyes. Then they stand up, and the hem of the bride’s sari is tied to the edge of one of the groom’s garments. Then they are led, first the groom and the bride following, around the altar seven times by one who we might think of as the best man, in this case, an older male cousin. They stop after the third time and there is an exchange of rings – the bride puts a ring on the big toe of the groom, the groom a ring on the fourth toe (the “beauty” toe in Hindu lore) of the bride. He has trouble making it fit, but finally manages it. After the seven circumnavigations of the altar, the two are brought to the presiding sannyasi for a benediction, and they are married! Afterwards, Krishnammal (and then I!) are invited to place more red powder marks on the foreheads of the bride and groom and drop some rice on their hair. (I have actually met the groom – he must have been around 12 at the time, and know his now Denmark-residing brother from the Right Livelihood Award ceremonies in Stockholm.) It is indeed a great honor, especially since Krishnammal is not actually even a member of the family, nor am I. But we are now! There is a large meal awaiting us, but we bow out beforehand, at 9:45 A.M. We have another long day ahead of us. As I travel around Tamil Nadu this January on my too-short visit with Krishnammal Jagannathan and Land for Tillers Freedom, I always greet everyone with two Vanakkams, one for myself, and one for George. I spoke with him the day before his death. He was looking forward to his visit to India in February, to greet all his old friends and to make new ones, and to introduce his two granddaughters to his great love for India, its culture, its food, and above all, as the home (though not the birthplace – that honor belongs to South Africa) of Gandhian nonviolence. Of course, he had friends among disciples of nonviolence all over the world. A convinced Quaker, he would have reminded anyone who is interested that the true name of Quakers is the Religious Society of Friends (or Friends of the Truth). Quakers believe (it is really our only principle), that there is a Light of conscience and truth within every human being, and that we must live our lives in service to this Light. But the way to find this Light is to find this same Light in our fellow human beings, regardless of their race, religion, national origin, or political persuasion. In that way, we must all serve as lamps for each other. Among Friends, who are often silent in their service and witness, George would have been thought of as a noisy Quaker and troublemaker (as am I). He served time in prison during World War II for refusing to fight, in prison after sailing a ship into a U.S. nuclear testing range in the Pacific Ocean in 1956, and walked through the United States and then to Russia in 1959 to protest against nuclear weapons. The Russian government was not fond of him either, as he insisted on handing out peace literature in the streets of Moscow. He was on the Delhi to Peking Peace March in 1962. He refused to pay taxes that went for war and preparations for war. And he helped train a whole new generation of American nonviolent activists in the Philadelphia Life Center and Movement for New Society, of which he was one of the founders. George was a great friend of Jayaprakash Narayan, S. Jagannathan and Krishnammal Jagannathan, Daniel and Hamsa Mazgoakur, and Jyotibhai and Malini Desai, and dozens of other Sarvodaya leaders and workers throughout India, as well as Lavanam at the Atheist Centre and S. R. Hiremath of Samaj Parivartan Samuday in Karnataka. While Professor Willoughby was extremely well-read (and was always recommending books to me even at the age of 95), he disliked it when people spent most of their time writing or theorizing about nonviolence. He would have said there were too institutions of Gandhian Thought, and not enough Gandhian thinking, and surely not enough Gandhian action. He was appalled by the idea that one could earn a certificate in Gandhian thought from a university – the certificate for Gandhian studies could best be earned by going to prison, or working with the poorest of the poor. He understood that Sarvodaya workers from the time of Vinobaji and JP would age, but was always hopeful that a new generation would emerge, and would improve upon the practices of the past. He did, however, have one criticism of Sarvodaya, which he did not share publicly, but which he did share with me, and which I feel it proper to share at this time. When there were riots against Muslims in Gujarat, he thought that all Sarvodaya workers should have dropped their work and their comfortable lives and rushed to Gujarat to protect the Muslims. This is what Gandhiji would have done, and to that extent Sarvodaya had forgotten the witness of Gandhi himself, and even the very reason for which he had given his life. When I saw George for the last time in November, he was physically vigorous, maintaining his wonderful sense of humor, practicing yoga (which he had taken up for the first time), and his desk was piled high with papers and books, and ideas for action. He died with is “list of things to do” in his pocket. It is now left for us to carry them out. More calls come in. It seems that one entire village is dismantling their homes. They are expecting not only to make bricks (they are first or second in line) or lay down the cement plinths, but to actually build their new homes in the next two weeks. This is an unexpected turn of events, and it is great to see the people taking initiative, and we will just have to figure out how to fall in line. Then a call from a feature writer from The Times of India – he wants an interview today. Under the best of circumstances, it could have been arranged, but we decide that will be better after we have pictures of the bricks being made, and the dismantled village. Now all three cell phones are going full speed in the back seat, while Muttukumar negotiates Chennai traffic! It seems we can’t meet with Stalin, the soon-to-be Chief Minister as he has left his home, and his schedule is full, and he must keep his appointments. That’s fine, we’ll catch him in a week when we return. Meanwhile we are rushing, in a rush-hour-traffic sort of way, back to Chengelput so that Sathya can meet with the District Collector (the local governor), as he is supposed to help her build an expanded clinic. About two-thirds of the way there (an hour and three quarters out of Chennai), we receive a call from Stalin’s personal assistant. Can we meet him at noon? It is 11:30 A.M. He really wants to see Krishnammal. Krishnammal says no, Sathya must get to Chengelput, as she is already 45 minutes late. Can we make an appointment for the 28th? Five minutes later, there is a call from the Deputy Chief Minister himself! He wants to discuss lorries and bags of cement. For a moment, Krishnammal considers dropping Sathya off, and turning right around and heading back into the Chennai traffic mess again. Reason prevails, and they agree to meet on the 28th. But, pleads Stalin, would she please come to a conference on housing (not to far from LAFTI’s headquarters) on March 3rd, to be presided over by the Chief Minister? YES! Fist pump! We are already plotting; she will have before and after pictures, a PowerPoint, some of the light green turbans (we’ll see about them), a fly-ash brick, and she will bring some of the women beneficiaries, the owners of the new homes, and make them available to the press. Well, there is no turning back now. Krishnammal has been awaiting for this moment for her entire 83 years, or at least since 12 when she wrote her first appeal to her classmates to abolish the mudhuts. We return home. She wants me to go take a nap. Actually, we both know that she is the one who wants to take a nap, but doesn’t like to admit it, so I go upstairs as if. But not for long. We have more visitors. These rather local. The first has been “working for Dalit welfare for 25 years.” I respond that I have been working for Dalit welfare for 32 years. He says that all the Dalit panchayat raj presidents (you can think of them as local mayors) have appealed to the national government for greater inclusion of Dalit concerns in the 11th “Five-Year Plan.” I respond that there were funds for Dalits in the first Five-Year Plan, the second, the third, and so on and so forth, and Dalits even got places in the government as minor functionaries, but that is a rather useless approach (I am being very direct, and Krishnammal nods approval – I can get away with saying things that she can’t). Anyway, I tell him when he is finished with social work, he can come to Kuthur, I will give him a turban, and we can build bricks together. That brings a few laughs from the others. But I give him a copy of The Color of Freedom as a gift. With him is the gram sabha president of Olallur, where the adivasi slum colony is located. She likes the idea of joining me in my brickmaking. She wants to open a new village school, but she needs Krishnammal to work with a recalcitrant landlord to get him to sell the land for it. It is all in a day’s work. We’re off! It’s time to go run around, and beg some more, and create a movement! Well, plans have changed again. It being wedding season (in the south; in the north it is usually May), Krishnammal has kept me around to do some wedding begging (to help raise funds for more houses, since her very presence is considered a great honor), and instead of heading for LAFTI’s headquarters in Kuthur, tonight we will go to Tiruchy, and then to Gandhigram! My home!! Needless to say, I am quite pleased with this plan, but I also know that the plan could – and likely will - change, so first things first. At any rate, I sit down on the divan at 5:00 A.M., pulling my legs up under me in yogic position (to avoid the mosquitos; I believe this is the true origin of the original yogic posture), and am still a bit groggy and nodding. Krishnammal had been up since 2:00. A.M. Swami David visualizes a copy of coffee appearing in front of him and hold ups his righthand with thumb across the palm, and, sure enough, the next moment there is a nice, steamy cup of Nescafe, that is, a quarter teaspoon of Nescafe mixed with six ounces of boiled milk. Om Shantih, Shantih, Shantih. Next, it is time for computer yoga. Krishnammal wants some more letters and appeals to appear. The magic netbook is produced, and, before one could chant the Shiva Purana, a letter to Guruji, he of Coimbatore and Holy Feet, is produced, meant obliquely to remind him of his promise of 1,000 doors for the new houses. Now the mosquitos are out in full force. I squash one against my leg, which leaves a bright red stain on my nice white wedding pants (they are the same handspun trousers I wear every day.) But they seem to enjoy Krishnammal more, and she has designs on my mosquito net. “Of course you can have it,” says Swami David, “What are your other desires?” Before we know it, we have completed a trade: my netbook (the one I am presently writing on) and the mosquito net, for a brickmaker’s uniform, and a light green turban. (I insist if we are going to start a housing movement, an end to the mudhuts, the brickmakers need a turban of an identifiable color, so I chosse the one from my Friends of LAFTI business card. She is soon on the phone to headquarters arranging the turbans.) I think I got the better of the deal, so I throw in my dark green sweater (she currently has an atrocious one in purple and black, which, with her Princeton tiger-striped woven headcovering, like an oversized potlholder tied around the neck, makes her quite a sight (and no, sigh, I haven’t a picture.) I think she is aware that without me, the magic netbook doesn’t produce letters and appeals, and I doubt very much that, even if I wear my brickmaker’s uniform and light green turban, I am likely to produce many bricks. Later, Swami David’s magic green bag produces 1,001 rupees for her to use in sacrifice to the voracious petrol gods. It is 6:30 A.M. now and the phone keeps ringing. The landlord with whom all the dickering has taken place for the last three months, has relinquished his 22 acres, payment has been made, and he wishes to convey his thanks. This is followed by a phonecall from one of the landlords who was directly culpable in the deaths of the 44 Dalit women and children in 1968, saying that his wife is sick, and will Krishnammal please come and comfort her? I am sure she will when we get to the area in an expected three days. Finally, we are away into commuter traffic to Chennai. It seems that all the cows and water buffaloes have the same idea. Then we reach the beginning of the toll road. Sometimes we pay, sometimes we don’t, it doesn’t seem to have any rhyme or reason (well, maybe rhyme). Sometimes we are waved straight through, other times Muttukumar shows them last week’s receipt, and sometimes they extract 30 rupees. Go figure. We find the wedding hall at 9:15. A magnificent place! We have missed the ceremony (ended around 9) but we can see that no fewer than 18 Brahmin priests officiated at the marriage ceremony of two Dalits. Unthinkable even ten years ago. But I think they have found a new, ready market for their products and services, so it is just good business. We are immediately passed to the front of the reception line – there must be multiple pictures with Krishnammal, and someday they will look back at their wedding pictures and wonder who that fat light-skinned beggar is. We do some begging as people rush up to Krishnammal to kiss her feet. This posting is an experiment. We actually left at 5:05 P.M., so I won the non-wager. Now I am writing in the car on our six-hour ride south. But I want to examine the scenery, so the Auspicious Day is going to have to be split into two parts. This evening, I got to join one of Sathya’s “fast-walks” around the neighborhood. She arrived home late from a long day’s meeting with the Ministry of Health, and then back to her neonatology ward. Sathya is an extraordinary woman. She is one of the state’s leading neonatologists, working for the princely salary of roughly $440 a month (plus funds for a driver), less than a newly appointed high school teacher. This requires some explanation. Most doctors of her stature in India are extraordinarily rich, millionaires or soon on their way to be. The way that happens is it is common practice to go the public hospital at 8 in the morning, leave by 11 (the three hours will be considered a full day’s work), and then practice at one’s own private clinic or hospital, where one will rake in the big bucks. Not Sathya. Ten- or twelve-hour days are the norm, and she is often called into her ward by her nurses in the middle of the night. She has also invented an inexpensive, locally produced incubator which, though much celebrated, she refuses to patent. She refuses to set up a private practice. She believes her work is her way of worshipping God, and has no interest in even asking for a raise. And lest it be thought that her pay should be considererd as recompense for three hours work compared with the teacher’s full commitments, there are more than a few teachers in various districts who never show up for work at all, but operate a business (often expensive tutoring, but it can be a shop of some kind) during normal teaching hours. It must have been good for the sleepwalkers who got up at 3:30 A.M. every morning to join Vinoba. I try it for awhile. No matter how hard I try, it comes out “Hari Ram, Hari Ram, Hari Ram” rather than “Ram Hari, Ram Hari, Ram Hari.” Backwards. Krishnammal asked me this morning whether I do yoga. “Oh, yes,” I reply, tucking my legs up under me, “Swami David does computer yoga every morning,” as I type away. Sathya says she actually came across Nagaraj for the first time, while on one of her walks. There was the group of slum children of Ollalur, Nagaraj with them, though he hung back a little from the rest. Eventually, his story came out. It turns out that he was probably thought slow by the child psychiatrist, not only because he was withdrawn and depressed, but because his native language was not Tamil at all, but Telegu, the language of Andhra Pradesh, the state to the north. It seems likely that this slum colony is made up of adivasis – forest tribal people – who, as “civilization” (and, likely, chemical factories) encroached on their traditional lands, they became permanent migrants. Among them, both the men and women drink, and it is thought that Nagaraj’s mother committed suicide. So now these Telegu-speaking children ages (perhaps) 5 to 9, are enrolled in for the first time in a Tamil medium school, where they also have compulsory classes in English. Every day, after school, they gather on Sathya’s porch to drill each other on their lessons, in Tamil and English. Their thirst for knowledge is extraordinary. I have seen this again and again among people attending school for the first time. I can only attribute this to the fact that they haven’t yet had senselessness beaten into them by generations of schooling. It will come, I’m afraid, it will come. I saw Nagaraj playing doctor with one of his friends yesterday. I ask Sathya whether he has any interest in the medical profession. “No,” she replies, “He always says he wants to be a policeman, so he lock up all the people who drink alcohol.” It makes perfect sense, of course, for it was alcohol that destroyed his former life, on the precipice as it already was. An observation appropo of my interest in public health: I have been here for ten days, among the rich and the poor, and I have not seen a single person smoking. Not one. I can remember 20-30 years ago when Indians were regular chimneys. “They were told it was bad for health, and so they stopped,” said Krishnammal. I shake my head uncomprehendingly. No tobacco addiction, no classes on the evils of nicotine in school, no…. I don’t even see a single tobacco ad in the popular magazines, of which we have quite a collection, as Krishnammal seems to be featured in half of them. Sathya tells me that one particularly effective method of getting people to quit (besides bans on smoking virtually everywhere) is that state law that requires that, when a cinema star – always the villain – is seen smoking a cigarette, the bottom of the screen must have a superimposed message that smoking is hazardous to your health. Similarly, when a character is seen drinking alcohol, there must be a similar warning against alcohol displayed on the bottom of the screen. Vacation from my vacation is now over. It’s back to work again. The day begins with Tipu having run off. We know why – he misses Amma. But we also know there is a dog-smuggling ring in the neighborhood (you can find everything in India if you look hard enough), and Tipu has been rescued from them in the nick of time once before. Finally, he is retrieved, and tied down in the house. Krishnammal returned from her two days at Madurai and Gandhigram. Tipu is jumping for joy! First she attended the wedding. She says she never got to eat, as people kept coming up and prostrating themselves at her feet. No one actually expected she would show up. I asked whether she brought a wedding gift. She sniffed, and waved her hand in the air. But she did spend her time canvassing for contributions. A third-grade boy (one of the thousand or so great-grand-nephews and nieces) ran up to her and proclaimed, “You are now in my history book!” Sure enough, Saint Run-Around is now in the required Tamil history books from the third through the ninth standards. Students may now have the opportunity to flunk a test for failing to recognize her name. I explain that to be “Helen Kellerized” is to have your life end at age 20, and all the things one stood for in life eliminated from public view. Find a children’s book about Helen Keller and you will never discover that she was an ardent socialist, an advocate of women’s rights, a pacifist who made strong statements condemning World War I at a time when it was unpopular to do so, and a ardent proponent of universal health care (which first became part of the public agenda during the administration of Teddy Roosevelt.) Since she was blind and deaf, authors have decided she was dumb as well. “Yes, yes” she says, “It will say I came from a poor family and the scheduled castes, etc., etc., and I did good things and won many awards.” We agree that it will never say that she is a fighter against globalization and multinational corporations and the prawn farms, campaigned against temples and rich landlords and against corporate encroachment on the people’s land and livelihoods, against all forms of militarization, and is a proponent of self-reliance and Gandhi’s village republic. Next she was off to Gandhigram Rural University, canvassing the various departments for contributions. She came back with a pledge for 5,000 bags of cement from the Vice Chancellor. As it turns out, Gandhigram has a housing program. They have received a lorry (we are jealous), jeeps, cement, and other building materials from the Central Government. They are all lying there unused. Krishnammal has invited them to our Independence Day (January 26th) and we will show them how the villagers can build their own houses. Her “special” night train from Dindigul was three hours late, and didn’t leave until 2:30 a.m., with her waiting in the station attacked by the inevitable railway mosquitos. Arrived here at 11:00, and by 11:10 we were off to Chennai, with Veerasami, who traveled another eight hours by bus to get here. After getting lost innumerable times, we finally found the offices of the M.S. Swaminathan Research Foundation, only two hours after we said we would be there. This is the appointment I have been trying to get for three months, and it is finally to happen. M.S. Swaminathan made his fame (and fortune) by being the chief architect of India’s “Green Revolution”, which, through the introduction of “modern” agricultural methods, including the use of patented seeds which had to be repurchased each year and artificial fertilizers, massively increased agricultural yields in northern India. Because the inputs were so intensive, the program could only be carried out with large holdings, and more than 90 million people ended up being essentially forcibly removed from the land, many crowded into India’s major cities to live in absolute squalor. India did, however, become a significant exporter of agricultural produce, even as domestic malnutrition has soared in the past two decades. All agree (including Dr. Swaminathan) that the Green Revolution has been an utter failure in the south. In recent years, Dr. Swaminathan has softened his views considerably, and now agrees that the sustainability must begin with more equitable distribution of land resources, and intense efforts at conservation and sustainability. Years ago, Jagannathanji visited this campus to make an unsuccessful appeal to Dr. Swaminathan to get him to condemn the new multinational-backed prawn farm initiatives that were destroying the land, only to be rebuffed. Ironically, Krishnammal and Dr. Swaminathan received the Padmashri (rather like the President’s Medal of Freedom) in the same year. We are not to see Dr. Swaminathan, but the Executive Director, and are quickly ushered into his office. This time, Krishnammal is here for display, and Veerasami to answer any questions about land conditions. This is my show. They are building a new pavilion near the entrance, and we joke that if we get nothing, we can take a bag of cement. He senses my discomfort, and notes that his rice is years from government approval. Sigh of relief. Next, he turns his computer screen towards us and shows a video I have already seen of former prawn farm land being used for fish farming in Andhra Pradesh, in a process developed by the Foundation. Not what I had in mind. We are not particularly interested in producing products for the market. We need rice land! He says that we should keep open minds about mixed uses, and I diplomatically agree that uses should be chosen based on environmental conditions, and we have grown mangroves close to shore (but the lands I am referring to are more than 500 yards from shore., and ALL the land we are talking about was former rice land.) Someone may make a nice fish farm in the estuaries – it just isn’t us! Then, bingo! There is a form of algae that can be raised in a small pond on one corner of a field during the rainy season. It is then spread over the entire area, and when it dries, it will leach salt from the soil! (He believes that the cancer-causing chemicals have long been removed from the soil in the rains – in reality, it doesn’t matter, as people have to live here in any case, Love Canal or not. In the next season one can grow rice! I show my intense enthusiasm. Then he mentions that there is a particular kind of salad green which can be grown which is very popular in Europe. I don’t see that happening. And some of the land can be used to grow forage for animals. I can get into that. We end with an agreement. He has a 12-person research team in Pompuhar, just south of LAFTI’s area, and he will direct some of the scientists to come look at the area in early February and take soil samples to see what can best be done. I can’t ask for anything more than that. If it happens, it is a start. I thank him profusely, say that if there is anything I can do in support from the U.S. to have him please contact me. And thanks again. I have no idea whether this will actually happen. I have been working on this intermittently for five years to no good effect, so I don’t want to get my hopes up too high. But maybe the stars have realigned after the solar eclipse. We shall just have to find out. Then more backing-and-forthing at the Secretariat. We get in during lunch hour, so there is no pass, but Veerasami shows the newspaper clipping of Krishnammal receiving the Ambedkar Award from the Chief Minister, and that is more than sufficient. Third-Floor Minister is in Delhi, but we take over his air-conditioned office and Krishnammal lies down for one of her 10-minute Gandhi naps. They actually should provide a bedroom for her at the Secretariat, as she is here so often, and she actually has camped for a day or two as necessary with Third-Floor Minister. Veerasami and I chase after Eighth-Floor Minister; he is nowhere to be found. But good news! We can see the personal assistant to Stalin, the soon-to-be Chief Minister! Now it is through the giant rabbit warren. Rooms with millions and millions of papers and files. It probably looks the same as it did during the British Administration. I take a photograph of an ancient Gestetner copy machine, still in use. But we are finally led into the office, everyone bows and is delighted to see Krishnammal (there was plenty of excitement on the elevator for just Veerasami, which is quite striking, dressed as he is in his rural wear, surrounded by western-dressed bureaucrats). The exemption for the stamp tax duty on the land purchase is now with Third-Floor Minister, we are told. This is good news – he is a friend. AND, we have a meeting with Stalin before a wedding we are now to attend (meaning 6:30 a.m.). I think Krishnammal is going to ask him for an immediate 50,000 bags of cement. And back to Chengelput. All plans are changed. For the next three days, I am going to weddings! I am to be the wedding beggar. I complain to Krishnammal that she is feeding me too well – no one will give to a fat beggar. But we are now a traveling road show. Saint Run-Around and the Fat Beggar. We end the day with my writing six fundraising appeals for bags of cement. All in a day’s vacation. In addition to the various forms of discrimination based on caste and religion, India suffers from rather extreme forms of color prejudice. It goes almost uncommented upon, but, and this is especially true in Tamil Nadu in the south, it is virtually impossible for an observant outsider to miss. I was immediately reminded of this on the plane over, on Jet Airways, an Indian airline. All the air hostesses serving the mostly Tamil passengers, whose skin color will vary from Nescafe to dark cocoa bean, were from Assam or Meghalaya, in far northeast India. The Assamese have extremely light skin, and some of the rounded facial features of the Burmese to the east. Peter tells me that the government once came up with a scheme to prepare young women for careers beyond those in which they are usually well accepted – teaching, and especially in the south, medicine and the health ancillary professions. They set up a training program to prepare Tamils to become airline stewardesses. Following graduation, not a single one was able to find employment in the industry. My language skills are not strong enough to follow Tamil TV (though I enjoy the broad humor and slapstick), but I can always tell what is the show and what the commercials. The TV stars will be Tamils, easily identifiable. But all the advertisements, and especially the incessant ones for beauty products, will feature light-skinned beauties, who, with dress changed, might have stepped out of the pages of Glamour magazine. The drug stores do a booming business in skin-whitening products (one would be horrified by the ingredients). Marital ads in the newspapers feature caste, income, employment, and then an array of English adjectives for color (fawn, cream-colored, or just plain light-skinned) designed to make the bride seem more desirable. When you see married couples, it is almost inevitable that the wife will be lighter-skinned than her husband, at least among the monied classes. This would not seem to have been an inevitability. Rama and his later incarnation Krishna are both supposed to be blue in color, signifying their darkness. Apparently, it wasn’t always so noticeable. When Sita choose her future husband out of a lineup, she chose Rama without regard to skin color, but rather noticed that his feet, like that of all god-figures, didn’t touch the ground. (Bhoomikumar reminds me that the fact that the flowers in the garland around his neck never drooped, and that he never blinks, was also a dead giveaway. Dark-skinned Krishna, whose skin is often compared to the blue of the sky at twilight, has no trouble attracting dozens of gopis – cow-maidens – once he starts playing on his flute. Lord Venkatesh, the god-figure at the Tirupati pilgrimage site, is totally blackfaced. One wonders whether color discrimination came to India among the many ills the British brought with them. I am quite willing to make use of my western status and white-skin privilege when it can serve the cause. Folks do a double-take when, among the western dress of the government office clerks and the bank managers, they see me in my khadi (homespun) pajamas and kurta. (That it is much more comfortable has nothing to do with it – well, okay, a little.) And I will dive into the brickmaking – not that I am strong enough to really do much, but it is my way of insisting on the importance of the work. For the first and last time on this trip, I became a tourist. I’m frankly not very good at it anywhere anymore, and especially not in India, where I have seen everything I really want to see in the tourist way of things multiple times, and am more interested in the descendants of the people who built the great temples (or, especially, those who were never even allowed to go near the great temples) than I am in the temples themselves. Nonetheless, with an afternoon to kill, off I went with my friend and driver Muttukumar to the shore town of Mahabalipuram, home to the great sculptures, the world’s largest bas relief, and shore temple created by the Pallava Dynasty in the 7th and 8th Centuries. It was a relatively uneventful 27 km. drive from Chengelput, past fields being subdivided for housing complexes with outrageous prices, goats, pigs, water buffalo, and cows occasionally clogging up the highway. We get to the complex and pay the 250 rupee entrance fee for me as a foreign tourist and 10 rupees for Muttukumar as a resident Indian. Then we exchange tickets, which confuses the security people (they don’t seem to be amused). We climb to the great cave, and take the obligatory photograph of me underneath and holding up “Krishna’s Butter Ball” (a huge boulder about 20’ feet across and 16’ high), and then milking the stone cow. We walk to the shore temple, of most interest to me because it was overtopped by the tsunami wave, yet remained wholly undamaged. Now, the Indian Government has built a large retaining wall in front, together with a larger sand barrier. The shore hotels just to the north seem all to have been rebuilt and are doing a booming business. In town, there are the day tourists, both Indian and western, and the longer-term ones, some obviously strung out. The local industry is stone carving. Some of the carvings are huge, such as a 9’ long recumbent Shiva in gray stone. Some of the work is pretty stiff, meant for the trinket market. Some of the pieces are really remarkable. On the way back, I purchase a present for Ellen my wife. More stuff to have around the house. Actually, it is quite intriguing, in a humorous sort of way. A semi-recumbent Ganesh – Vinayaka – bringer of boons, remover of obstacles, Lord of new beginnings, and second chances – carved in a reddish marble, seated on what could be a recliner, an Apple laptop on his lap. Whether it more resembles Ellen or myself will have to remain open to interpretation. We drive back. I notice a political sign of a variety I’ve never seen before. It features Dr. Ambedkar, the great Dalit statesman, and Che Guevara in the corner, with the faces of others standing for election. It seems there is now a Dalit political party, which, in certain areas, could prove a majority if they organized themselves well. I think this a remarkable development. The sides of the roads, and the area around some of the monuments are filthy, covered in refuse. Anyone from the West who visits India gets a first impression that Indians must be a filthy people, as they throw garbage and refuse any which way without a second thought. A longer look will reveal that Indians make different distinctions between private and public spheres and spaces than most westerners, and are actually quite fastidious about personal and household cleanliness (though try staying clean in a mudhut!) But closer examination reveals something further. Rural India and Indians (some 70% of the population, and most of the people in cities have only relatively recently arrived) have been invaded by indestructible packaging that they didn’t ask for: plastic bags, plastic bottles, Styrofoam, aluminum, cans (which are often put to secondary and tertiary uses), etc. None of this was their choice. If you look more carefully, whether it be by the side of the road, or outside stores and tea shops, or by the sides of homes, even the mudhuts, there are signs of constant rubbish fires as Indians try to dispose of the flotsam and jetsam that have been inflicted upon them. All to no avail of course; the mountains of trash grow ever greater. There is no municipal trash pickup; the only substitutes are the goats, and even they have their limits. We return back to Sathya’s house. There are the eight children from Nagaraj’s settlement sitting on the porch, all in their school uniforms, watching as Velmuruga tries to teach them to read, “Tongue and teeth are in my mouth.” I interrupt, and treat them to a rousing version of “Head and shoulders, knees and toes.” Somehow I get tongue and teeth, elbow and belly in there too, and I think this is likely the high point of the kids’ day. Or perhaps not – but it is the high point of mine. There are no lights in the stone; there are lamps in the kids. Veerasami has arrived from Kuthur. Took him eight hours. I have Sathya translate for me the mission I have for us tomorrow. We will get back to the important work of begging.